Authors: J. R. Trump et al. Since the discovery of the first quasars in the 1960s, astronomers have struggled to introduce some sort of order into the zoo of objects known as Active Galactic Nuclei (AGN). These are the supermassive black holes at the centers of galaxies that are still accreting matter (as opposed to quiescent black holes, such as Sagittarius A* at the center of the Milky Way). A quick glance at our galaxy and AGN glossary gives an idea of what a daunting task this is. A breakthrough occurred in the 1980s, when it was noted that some differences in AGN features could be explained as a result of viewing angle (e.g. Krolik & Begelman, 1988). This has become known as the unified model of AGN. This illustration shows the geometric dependency of the unified AGN model. The broad-line (BLRG) and narrow-line (NLRG) regions are shown, as well as the "obscuring torus". A number of other AGN types are named as well. From Urry & Padovani, 1995. In the unified model, two main types of AGN, broad-line (or type I) and narrow-line (type II) are postulated to be the same sort of object, whose appearance depends on the viewer’s line of sight. The two types are so-named because of the characteristic emission lines in their spectra – type I AGN have very broad emission lines and a higher level of continuum emission, while type II AGN lack the broad-line signatures and instead feature very narrow emission lines and weaker continua. The idea behind the unification scheme is that the central black hole is surrounded by an “obscuring torus” of gas and dust. Thus, if the broad emission lines are produced in a region close to the central black hole, while the narrow-line features are created at a more distant radius outside the torus, it is possible for the broad lines to be hidden, depending on the angle at which the AGN is seen. The best evidence for this scenario comes from spectropolarimetry observations of some type II AGN in which broad emission lines are seen in polarized light, as would happen if the broad-line region truly were hidden, and the light were being reflected off the torus and into the viewer’s line of sight. As successful as the unification scheme has been, there are still some problems that cannot be explained solely via geometric obscuration. Many type II AGN are not observed to have a hidden broad emission line region, even in very deep observations of polarized light. In addition, the X-ray spectra of many type II AGN do not indicate large column densities of absorbing gas, as would be expected if the AGN were surrounded by an obscuring torus. Due to these limitations and others, the authors of this paper seek another ﻿physical motivation for the differences between the observed types of AGN; the factor they specifically consider is the AGN accretion rate. To conduct their study, Trump et al. assembled a large, relatively unbiased sample of AGN from the COSMOS field, along with their accretion rates. The parent sample consisted of a previously published catalog of broad-line, narrow-line, and “optically dull” (i.e. lacking emission lines entirely) AGN that were selected by their X-ray luminosities. Every object in the catalog has a widely sampled spectral energy distribution (SED) from radio to X-ray, and Hubble/ACS images. Because AGN luminosity is powered by accretion, the accretion rate can be quantified using the ratio of the AGN’s intrinsic luminosity, Lint, to its Eddington luminosity, LEdd, which depends only on the mass of the black hole. To calculate Lint for the broad-line AGN, the authors used the optical, UV, and X-ray portions of the SED to fit a simple model of an accretion disk, which was then integrated to obtain a total luminosity. For the narrow-line and optically dull AGN the same method was used, but first the luminosity of the host galaxy was subtracted using a galaxy template that was determined by looking at the Hubble/ACS data, because the luminosity of type II objects is often dominated by emission from the host. In order to calculate LEdd an accurate estimate of each black hole mass was needed. Again, two separate methods were used for the different types of AGN in the sample: for type I the black hole mass was estimated using an emission line scaling relation, while for type II and optically dull AGN a black hole mass to bulge luminosity relation was used. The authors then checked to see that the two methods gave consistent measurements, which they did, to within the scatter of the data set. 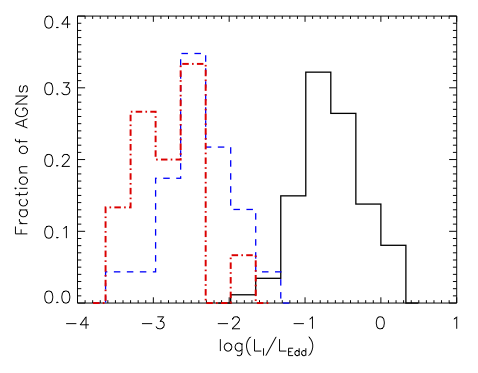 This figure shows the significant difference in accretion rate between type I AGN (the black histogram), and type II and optically dull AGN (blue and red histograms, respectively). Fig. 5 from the paper. The most obvious result of the paper is shown in the figure at left. The authors find a clear and signficant difference between the accretion rates of the broad-line AGN (Lint/LEdd > 0.01) and the narrow-line and lineless AGN (Lint/LEdd < 0.01), implying that accretion rate, not just geometrical orientation, must play a large role in the emission-line features seen in AGN spectra. This leads the authors to explore the implications of an accretion model in which low rates of Lint/LEdd < 0.01 cause the black hole accretion to change to a radiatively inefficient accretion flow (RIAF), which would give rise to the much lower luminosities observed in the type II half of the sample. In the RIAF model, once the accretion rate falls below the critical level, the accretion flow becomes geometrically thick, essentially surrounding the black hole, and the radius at which the broad emission line region forms is completely engulfed. This model is supported by a number of other results in their data. For example, the RIAF model predicts higher relative radio luminosities for the lower accretion rate sample, which is seen. In addition, the geometric obscuration model predicts the existence of an “obscuring torus” signature which should be seen in the infrared data of both samples, but it appears to drop out in over half of the lower accretion rate sample. However, if this signature were due instead to the dusty wind driven by high accretion rates, then it would be expected to drop out as the wind becomes engulfed by the RIAF, as is seen in the data. The paper concludes with a simple schematic model (shown below) highlighting the differences in AGN as their accretion rate drops. The upper half of the figure shows a high-accretion-rate AGN surrounded by a thin accretion disk, which is blowing off a disk wind from which the broad emission lines are expected to be emitted. 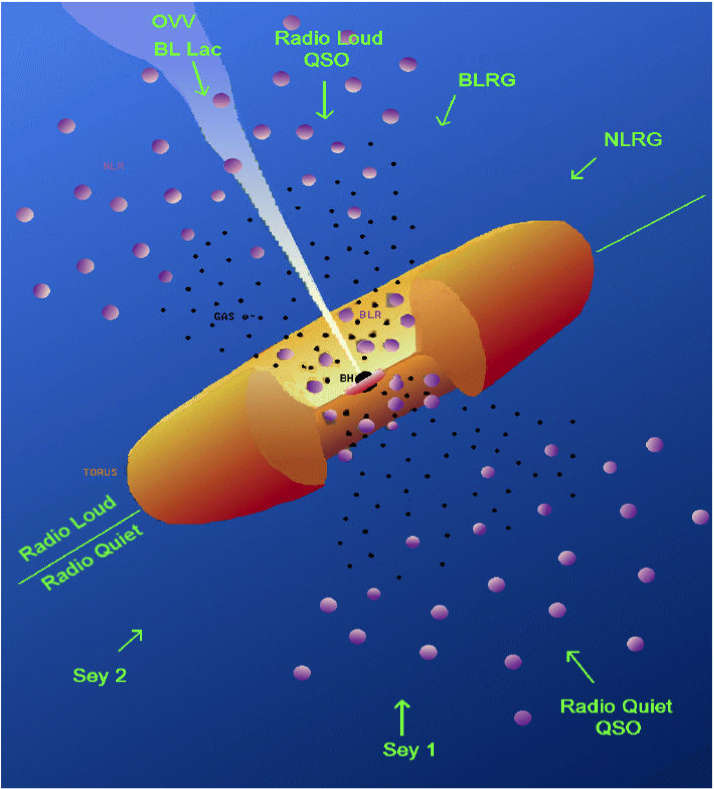 The lower half of the figure shows a low-accretion-rate AGN surrounded by a geometrically thick RIAF, in which the dominant outflow is a radio jet. 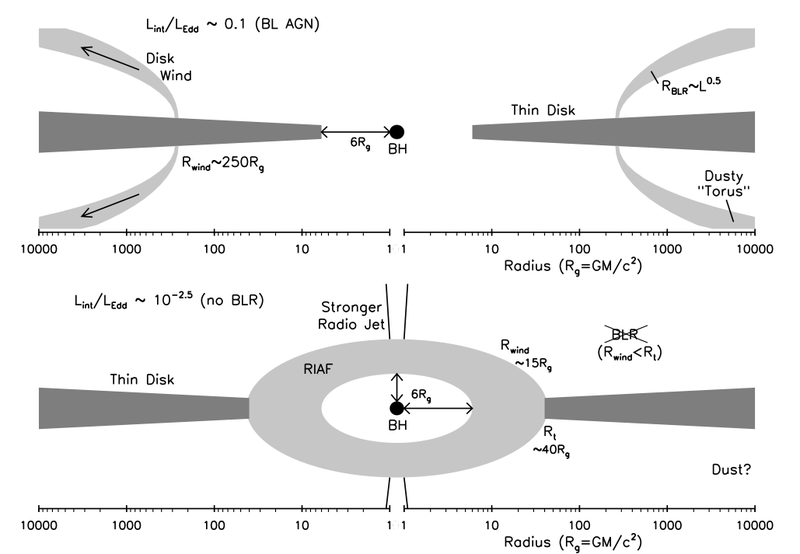 This schematic model shows the key differences between an AGN accreting at high rates, which is characterized by a strong wind, and one accreting at low rates, which is surrounded by a geometrically thick RIAF. Fig. 9 from the paper.